Bars or restaurants with an Albany skyline view? 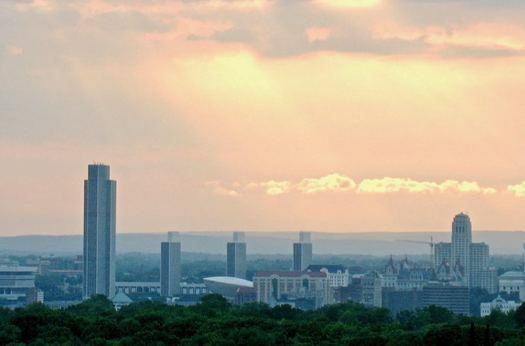 Looking for a bar or restaurant with a view of the Albany skyline that is also outside... A roof preferably. You might think there would be a lot of spots like this because Albany does have a rather distinctive skyline. When we thought about it, though, there wasn't much that came to mind. A lot of other cities/metro areas have dining/parks/whatever that take advantage of these sorts of views -- especially along rivers -- but this area not as much (in part because of 787, probably). Maybe that's starting to change with new development on the Rensselaer side of the Hudson across from downtown Albany. And maybe new amenities -- like the proposed/hoped-for pedestrian walkway on the next Livingston Ave Bridge -- would help spur that sort use and development. But maybe you know of some spots. If so, please share! The Sports Grill in East Greenbush. Typical sports bar fare, but the patio has a wonderful view of the Albany skyline. The City beer Hall has a nice view of the Empire State Plaza from it's back patio. A Better Bite in Albany has a great view and you can eat outside, but it's really only open for breakfast and lunch. However-- it has a pretty good weekend brunch! I don't think people know about it, but they should! I agree with C, City Beer Hall has a very interesting view of the plaza from the patio.